You may have heard people talk about how they eat “clean food” or eating a “clean” diet. While there is no specific definition for clean foods, eating clean means sticking with foods that are as close as possible to their natural state. You want to avoid preservatives, coloring, and man-made chemicals. The following are a few steps you can take to begin making the necessary adjustments to what you currently eat. They will help keep you healthy into your future. If you don’t already eat fruits and vegetables on a daily basis, then you need to start. If you do, then you need to make sure you’re eating enough. Fruits and veggies provide fiber essential to healthy digestion. They also provide vitamins that fight off disease, and healthy sugars that provide energy to work, think, and play. Your good health awaits you in the produce section. When you go whole grain, you’re getting back to basics. The benefits of eating whole grains are undeniable. Medical studies show that whole grains reduce the risks of heart disease, diabetes, and obesity, just to name a few. Whole grains include wheat, corn, rice, oats, barley, and more, when eaten in their “whole” form. And yes, this even includes popcorn! Whole grains have valuable antioxidants not found in fruits and vegetables, as well as vitamins, magnesium, iron, and fiber. So, when you include fruits and vegetables, along with whole gains in your daily meals, you are well on your way to better health. “No way… I’m not giving up my meat and potatoes!” Okay, settle down. Nobody is asking you to give up anything. This doesn’t mean you give up meat; it just means you should change things up. Proteins and amino acids come in various shapes and sizes. Instead of beef 7 days a week, you could substitute poultry, seafood, or pork. And when you do eat beef, make sure it’s pasture-fed and the leaner, the better. If you eat meat, you need to find a balance and eat in moderation. In fact, if you could incorporate one meatless day into your plan, that would be even better. Your plant-based alternatives are less processed than meat and provide lots of nutrients. Processed food can’t be completely eliminated from your diet; that’s just unrealistic. Unless you live on a deserted island, it’s just not going to happen. If you shop at a local farmer’s market for fruits and vegetables, you’ll be doing yourself a favor. Food products from the farm directly to the consumer means there is little to no processing involved. 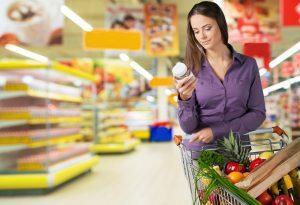 If you shop at a grocery store, which most of us do, then chances are you will be purchasing foods that have been moderately to heavily processed. Anything that is packaged, boxed, or canned has been processed to one degree or another. What you can do, if you’re really serious about eating clean foods, is start your own garden. No, that’s not a joke. People are starting their own gardens and growing their own vegetables every day regardless of where they live. Short of taking that step, you need to learn to make better choices to mitigate the damage to your health. So exactly how do you identify clean foods? When reading food labels, which you should be doing all the time, you want to avoid most foods with more than 5 ingredients. One-ingredient foods, such as apples, oranges and other fruit in their natural state, are examples of clean foods. And you definitely want to avoid the big 3 added ingredients which cause the most havoc to your health – salt, sugar and dietary fats. Another tip is to turn away from products that are “made with whole grains.” Instead, go for 100% whole-grain products. Refined grains such as bread, cereal, and pasta which are made from white flour should also be avoided. But whole-grain pasta, cereal, and bread are considered clean foods. This means no more cans of soup or candy bars; fried chicken and french fries. Fresh poultry, seafood, and meat are usually fine as long as you take it easy on the creams or sauces. 1. If there are more than 5 ingredients, look for an alternative. 2. If the food you are thinking about purchasing is in a package, it has been processed to some extent. 3. If you read a food label and there are ingredients with names that you cannot pronounce, put it back on the shelf. 4. Most foods with organic labels are cleaner than other options. 5. Avoid trans fats, monosodium glutamate (MSG), high fructose corn syrup, other sugars, sodium and other salts, and white flour. 6. If you see the following ingredients, you are looking at extremely processed foods. Now that you know how to identify clean foods, you can begin to plan your meals. Eating clean foods isn’t a fad; it was how our grandparents, great-grandparents, and great-great-grandparents ate. They didn’t have a Safeway or a McDonalds to run into for something quick and easy. They ate what they grew. It is now up to us to take charge of what we eat to reverse whatever damage we’ve inflicted upon ourselves. And then it is up to us to stay on that path to maintain a healthy lifestyle.